New type of stem cell easier to grow, more versatile. Both the professional scientific media and the lay science media devoted considerable ink and electrons this week to the announcement of a new type of stem cell—and not just any stem cell, a pluripotent one, so it is capable of making all our tissues. On first blush it appears to be easier to grow in the lab, possibly safer to use clinically, and potentially able to generate whole replacement organs. 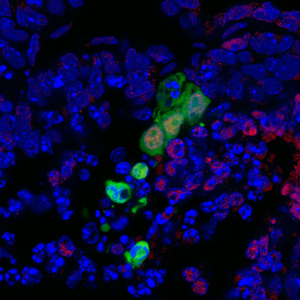 The newly found stem cells (shown in green) integrating into a mouse embryo. How a team at the Salk Institute made the discovery was perhaps best described in the institute’s press release picked up by HealthCanal. They sought to isolate stem cells from a developing embryo after the embryo had started to organize itself spatially into compartments that would later become different parts of the body. By doing this they found a type of stem cell that was on the cusp of maturing into specific tissue, but was still pluripotent. Using various genetic markers they verified that these new cells are indeed different from embryonic stem cells isolated at a particular time in development. The Verge did the best job of describing the most far-reaching potential of the new cells. Unlike earlier types of human pluripotent cells, these human stem cells, when transplanted into a mouse embryo could differentiate into all three layers of tissue that give rise to the developing embryo. This ability to perform the full pluripotent repertoire in another species—creating so called chimeras—raises the possibility of growing full human replacement organs in animals, such as pigs. The publication quotes CIRM science officer Uta Grieshammer explaining the history of the work in the field that lead up to this latest finding. Stem cells boost success in in vitro fertilization. Veteran stem cell reporter and book author Alice Park wrote about a breakthrough in Time this week that could make it much easier for older women to become pregnant using in vitro fertilization. The new technique uses the premise that one reason older women’s eggs seem less likely to produce a viable embryo is they are tired—the mitochondria, the tiny organs that provide power to cells, just don’t have it in them to get the job done. But being the good reporter that she is, Park also quotes experts that note no one has done comparison studies to see if the process really is more successful than other techniques. Why bug linked to ulcers may cause cancer. The discovery of the link between the bacteria H. pylori and stomach ulcers is one of my favorite tales of the scientific process. When Australian scientists Barry Marshall and Robin Warren first proposed the link in the early 1980s no one believed them. It took Marshall intentionally swallowing a batch of the bacteria, getting ulcers, treating the infection, and the ulcers resolving, before the skeptics let up. They went on to win the Nobel Prize in 1995 and an entire subsequent generation of surgeons no longer learned a standard procedure used for decades to repair stomach ulcers. In the decades since, research has produced hints that undiagnosed H. pylori infection may also be linked to stomach cancer, but no one knew why. Now, a team at Stanford has fingered a likely path from bacteria to cancer. It turns out the bacteria interacts directly with stomach stem cells, causing them to divide more rapidly than normal. They found this latest link through another interesting turn of scientific process. They did not feel like they could ethically take samples from healthy individuals’ stomachs, so they used tissue discarded after gastric bypass surgeries performed to treat obesity. In those samples they found that H. pylori clustered at the bottom of tiny glands where stomach stem cells reside. In samples positive for the bacteria, the stem cells were activated and dividing abnormally. HealthCanal picked up the university’s press release on the work. He discusses the fears of genetic errors and the opportunity to layer today’s existing inequality with a topping of genetic elitism. But he also discusses the potential to cure horrible genetic diseases and the possibility that all those strained graduate student eyes might bring down the cost to where the genetic fixes might be available to everyone, not just the well heeled.